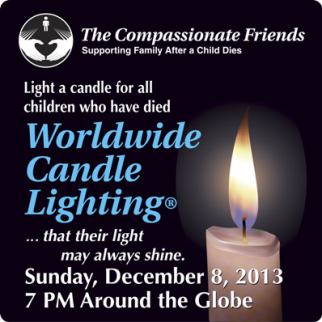 This will be the 17th Worldwide Candle Lighting sponsored by The Compassionate Friends, an organization whose purpose is to support families grieving the loss of a child. I cannot imagine how mourning parents, siblings, and grandparents feel. I cannot fathom the levels of pain they experience year after year as unfulfilled birthdays, holidays, and milestones echo within empty places in their hearts. But all through the year I can acknowledge their pain. I can listen to their feelings and memories. I can share my love through kindness and concern through my actions. I can offer my tears along with my prayers. And this Sunday, I can light a candle. To show your support, you can, too.